Located off the northwest tip of Europe, Ireland is an island nation, home to a small variety of native animal species. After the last Ice Age, which occurred around 10,000 years ago, Ireland became isolated from Britain and mainland Europe, limiting its indigenous animal populations to a small number of species. Many species flourish today, and some are considered endangered by invasive species. 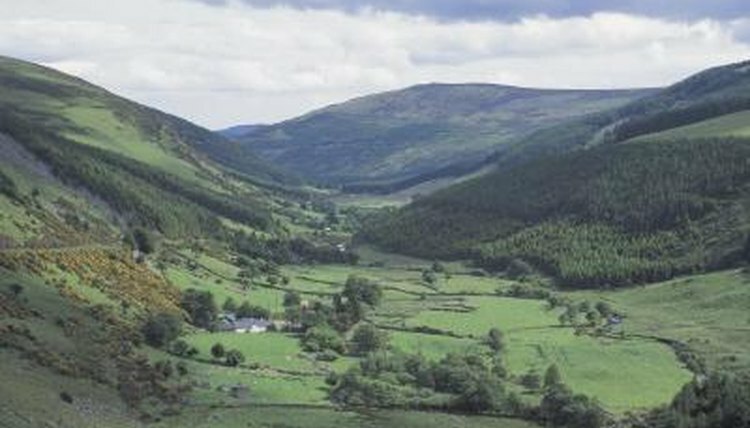 According to Ireland's National Parks and Wildlife Service, 26 terrestrial mammals are native to Ireland. Only animals that were present on the island or naturalized prior to the year 1500 are considered native. These animals make up only 13 percent of the mammals found elsewhere on the European continent. This lack of animal diversity began when sea levels rose at the end of the last Ice Age and Ireland became an island, preventing land or freshwater migration there after the thaw. Only birds and sea creatures were able to migrate to the island, and their consistency matches that of those in the rest of Europe. Animals indigenous to Ireland include the pygmy shrew, red squirrel, pine martin, red deer, Irish grey partridge, wood mouse and Irish hare, according to Discovery News. In addition, the badger, hedgehog, rabbit, red fox, Irish stoat, otter and ten species of bats are indigenous to the Emerald Isle, according to Ireland's NPWS. While the famous legend of Saint Patrick describes how he drove all of the snakes out of Ireland, this is more than an allegorical tale; it's grounded in reality. Snakes are not native to Ireland. In fact, Ireland is home to only one type of terrestrial native reptile, the viviparous lizard, which gives birth to live young like mammals. Among the animals native to Ireland are three native species of amphibians, those being the common frog, the common newt and the Natterjack toad. The Birdlife International Avibase says 470 bird species live on the island. Two of these avian species have been introduced and the rest may not live on the island year-round due to migratory patterns. While the surrounding sea is rich in marine life, including dolphins, whales, turtles and sharks, freshwater native fish are limited to pike, perch, bream and rudd, according to the U.S. Department of Energy's Ask a Scientist! website. Trout and salmon regularly come to spawn in the streams of Ireland. Some animals that humans have introduced to Ireland's ecosystem have had harmful effects on the native species. Such unwanted species include the grey squirrel, the bank vole and the greater white-toothed shrew, according to a study published in the June 2012 issue of "Biological Invasions." These introduced species threaten the native red squirrel, the pygmy shrew and the wood mouse. Other native species under threat include the Irish hare and the red deer. Of Ireland's indigenous animals, those currently extinct include the great Irish elk, the grey wolf and the great auk, according to the Authentic Ireland website. All three were hunted to extinction by humans. The previously regionally extinct golden eagle, white-tailed eagle and red kite are being successfully reintroduced into the country, according to the Golden Eagle Trust.